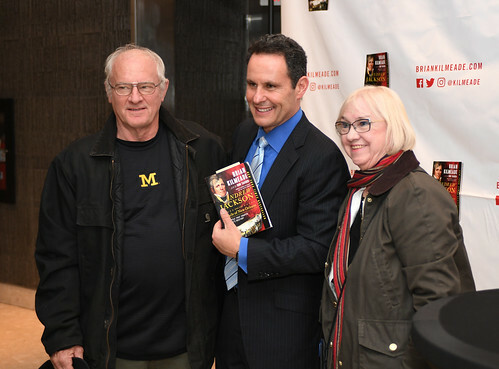 Author and radio host Brian Kilmeade presented insights from his new book Andrew Jackson and the Miracle of New Orleans at the Gerald R. Ford Presidential Museum on November 1, 2018. Kilmeade’s new book brings the reader to the scenes of the Battle of New Orleans, one of the most pivotal and surprising battles in American history. Andrew Jackson and the Miracle of New Orleans attempts to find the moment that illustrates who is Andrew Jackson, and in so doing remind the readers why he is celebrated. The book also introduces a fantastic cast of characters including an enemy Creek-Indian who reflects many of Jackson’s qualities, and the British Admiral whose poor decisions weakened the fighting-ability of the British land forces. After joining Fox News in 1997, Brian Kilmeade was soon named co-host of Fox & Friends, where he still thrives today. Kilmeade also hosts his nationally syndicated radio show, The Brian Kilmeade Show on Fox News Talk. Prior to joining FNC, Kilmeade was an anchor/reporter on NEWSPORT TV. While in Los Angeles, he was an anchor on KHSC-TV and a host on all sports radio’s XTRA AM690. One of his first jobs was as a correspondent on Channel One, a daily national high school television news program. Kilmeade has written 5 books, 4 New York Times best sellers, including George Washington’s Secret Six, Thomas Jefferson and the Tripoli Pirates, and Andrew Jackson and the Miracle of New Orleans co-written with Don Yaeger. Kilmeade agreed with many historians that Gerald R. Ford was an example of how our country gets the right person, at the right time, in the right place to run our country. The best example that Kilmade could give was George Washington, with another being Andrew Jackson. While discussing his new book, Kilmeade details how 29 years after the American Revolutionary War, the British felt they had their opportunity to win. With the British military having recently defeated Napoleon, they were prepared to beat the Americans. As war started, the British were able to set the White House on fire and scattered the American militia with ease. Americans were on the brink of losing their country. Andrew Jackson became a great hope for the young nation in defeating the British once and for all. Upon heading south from Tennessee with his 1,500-men militia, Jackson first worked with a convent to raise his army to 5,000 men. Meanwhile the British had an army of 9,000 with war experience. Jackson’s army had little to no war experience and included freemen of color, cajuns, pirates, Choctaw Indians, Cherokee Indians, militia, Kentuckians, and Tennesseans. Upon their arrival to the area, the American army ruthlessly attacked the British to weaken their fight, then dug massive berms as part of the New Orleans defenses, along with building a canal that the British would have to fight through. The American army beat the British at the Battle of New Orleans in 45 minutes. Winning the Battle, Kilmeade states, saves the American port of New Orleans and American control of the Mississippi River. Without that win, American expansion to the West would have been stymied as the British may have then claimed the area of the Louisiana Purchase. America also showed they could defend their country against the strongest military force in the world at that time in history, not once, but twice in 29 years.